In Belgaum there are two GTS (Great Trigonometrical Survey) benchmarks. 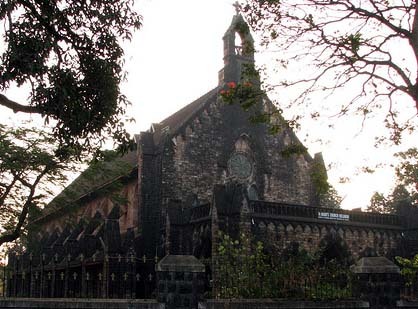 The first is housed in the St.Mary’s church premises in camp and the second one is placed at the Circuit House. GTS is the standard is for establishing the elevations of the above mean sea level from a specific reference land surface. This was established in 1907 as 2523 feet above mean sea level. A G.T.S. (Great Trigonometrical Survey) benchmark is a permanently fixed reference survey station (or point), having known elevation with respect to a standard datum (mean sea level). These are established all over India by Survey of India department with greater precision. A benchmark value is quite essential at any survey area, especially for reduction of observed sea level with respect to mean sea level or chart datum (CD). While carrying out bathymetric survey of a survey area, the datum referenced values thus obtained are used to compute the final depth contours of the survey area (with respect to CD). So, a benchmark, having known elevation is quite essential at the survey area, without which, preparation of a bathymetric chart is impossible. In some places, GTS benchmarks are available within a kilometer distance and can be easily transferred to the survey area by fly leveling using an automatic Level instrument and a graduated leveling staff. But in most of the cases, GTS benchmarks may be at far away distance from the area to be surveyed. In these cases, the most common traditional method of transferring the benchmark value using an automatic level instrument is a difficult task, consuming enormous amount of time and labour. To eliminate this process, a method is suggested in this technical report to transfer GTS benchmark from any far distance to the survey area. A latest Electronic Total Station (ETS) is the instrument that can be used for this purpose. The main advantage in applying this method is that considerable amount of time can be saved while maintaining the required accuracy. For your information GTS benchmarks are established by British (East India Company), during Great Trigonometrical Survey of India, which began in the year 1802 under the leadership of William Lambton, after his death survey was carried under the leadership of George Everest. During the survey of Himalayas George Everest died, he was not involved in the survey but he hired Andrew Scott Waugh, who made first measurements of the Himalayas. Indian origin Radhanath Sikdar who calculated the height of the Himalayas. Before the completion of survey George Everest died and the mountain then known as Peak B is renamed as Mount Everest. It is also to be known that Survey of India was established by the British only. As a surveyor I’m proud of my profession. Thank you very much for this article.